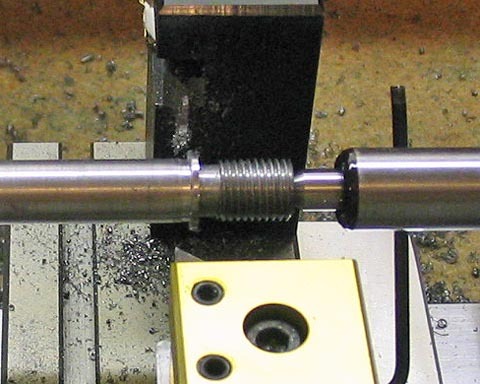 I made this auxiliary spindle for my Taig lathe as a means of completing another project I had started. 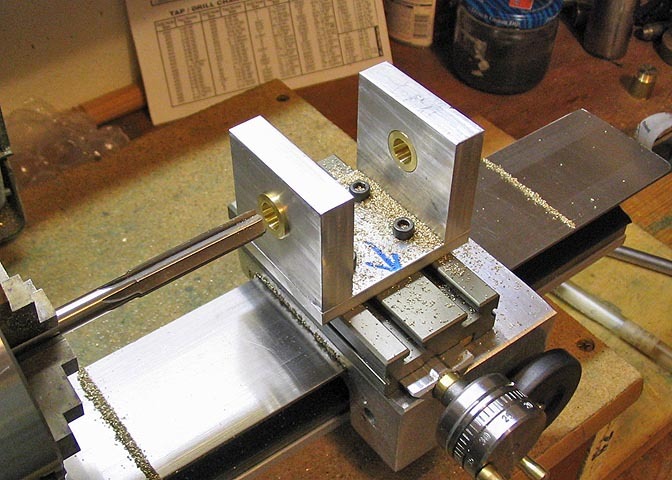 piece mounted to the lathe spindle. 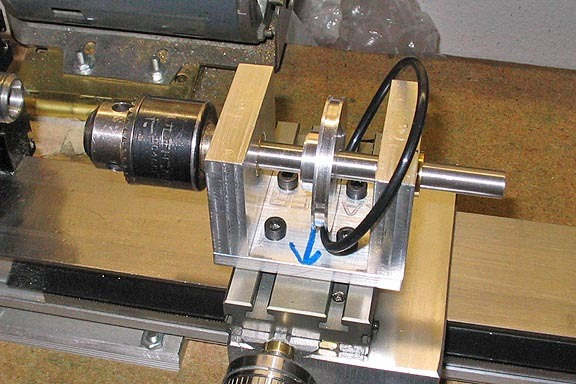 An auxiliary spindle that mounts to the lathe cross-slide will do it. or you can start here at the top and see how it all came together. 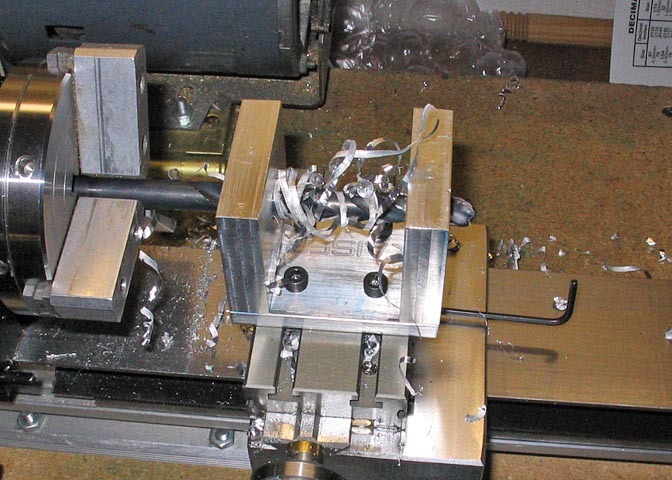 Probably, the cleanest way to make the body of the spindle would be to mill it from a solid block of aluminum. I didn't have a large enough piece for that, so I went with a built-up unit. 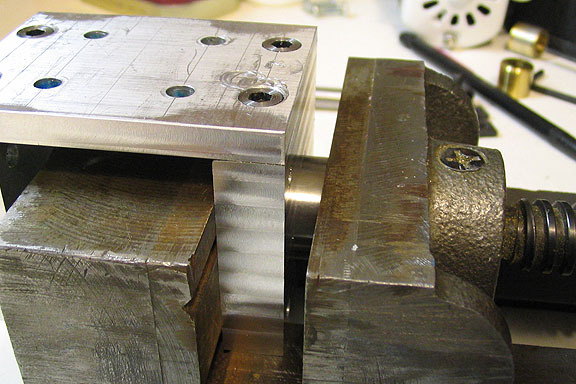 being cut square with a slitting saw. 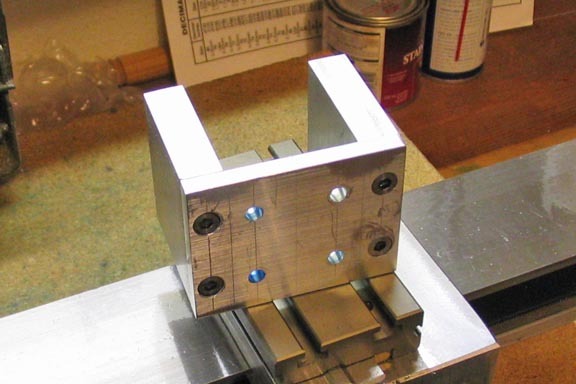 The sides, or uprights for the body are milled square. uprights. 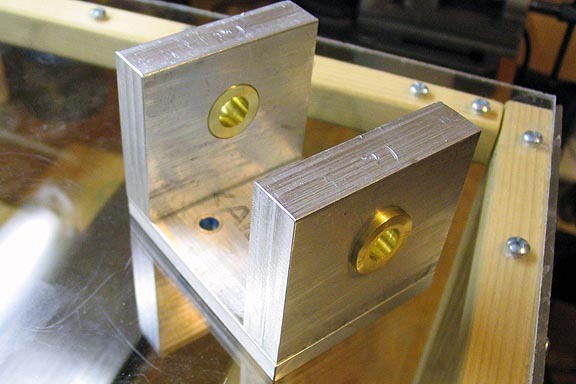 I had to face off the heads of the socket screws to allow them to mount flush with the base. 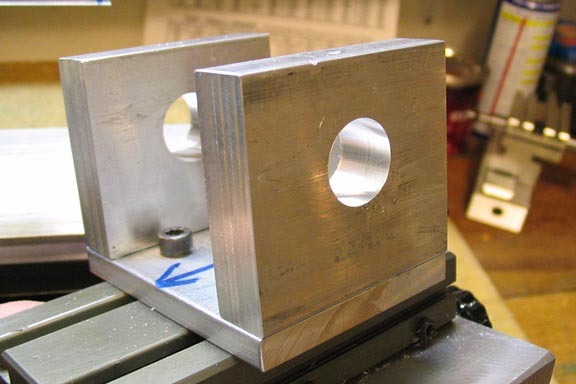 The assembly is mounted square on the cross slide, and the center point of the uprights drilled through. 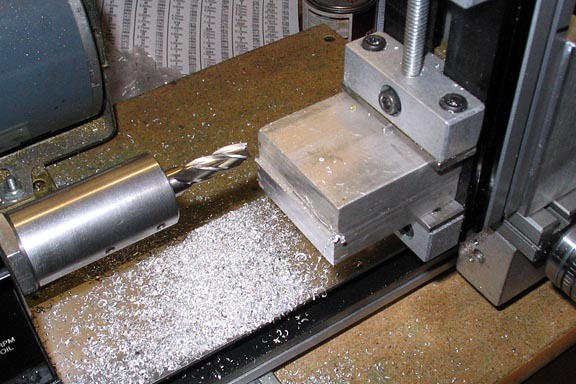 The drilled hole is just a starting point for boring. center drill. 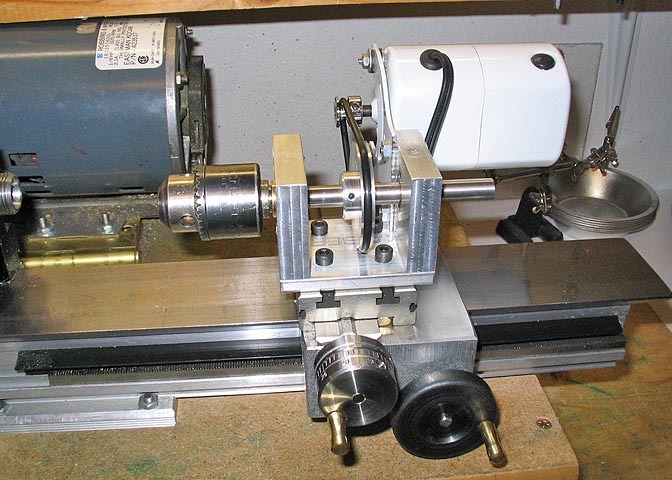 Then a cigarette paper is held between the center drill and edge of the upright while you spin the chuck. By the way, I don't smoke. I buy Zig-Zag cigarette papers at the market and keep them in the shop for this. line boring, and that is probably the more common term. 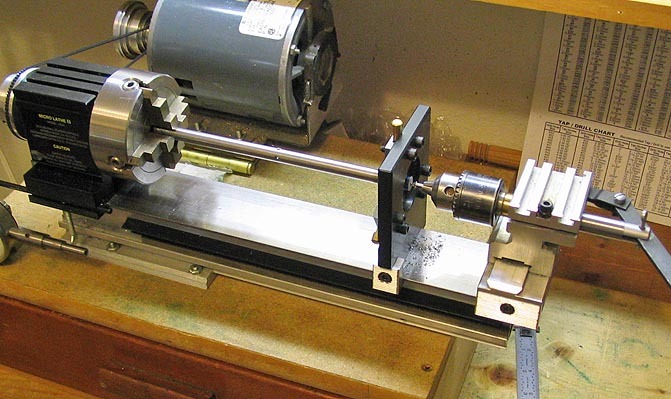 a much larger lathe. 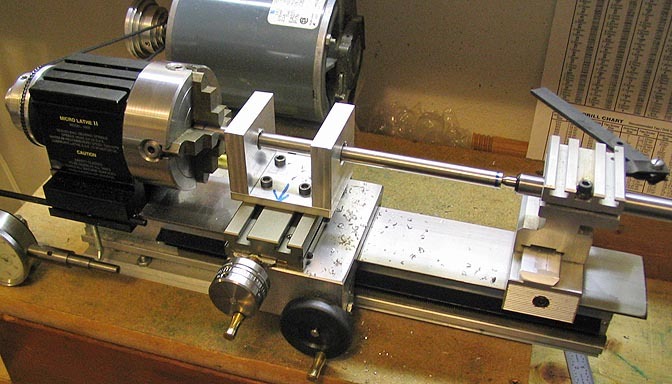 I have to make a small one, suitable to the Taig lathe. 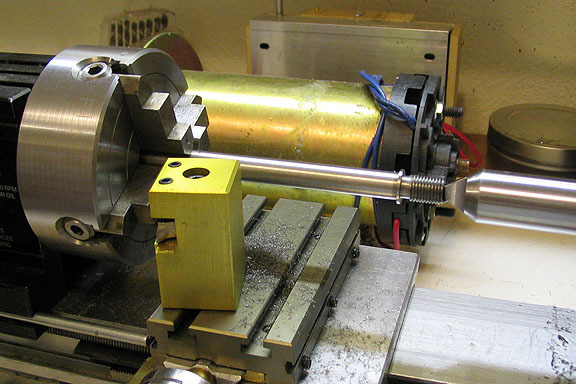 the body of the spindle pass over the hole, without running into the lathe chuck, or the tail stock. 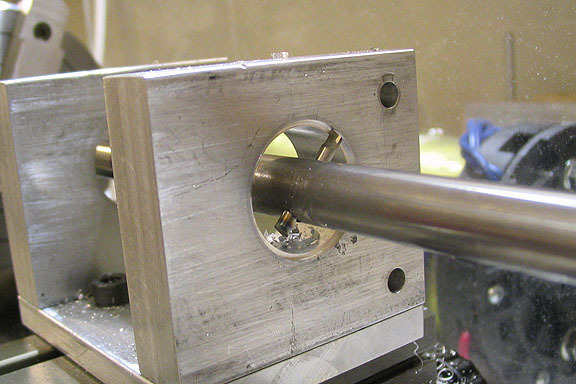 Also, a single hole was drilled and tapped for the set screw to hold the cutter. 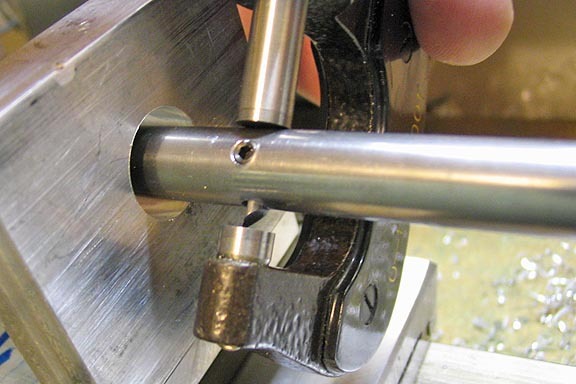 hole for the center, which will hold the bar true during boring. the cutter to be sharp enough for the job. The final step is a light honing. 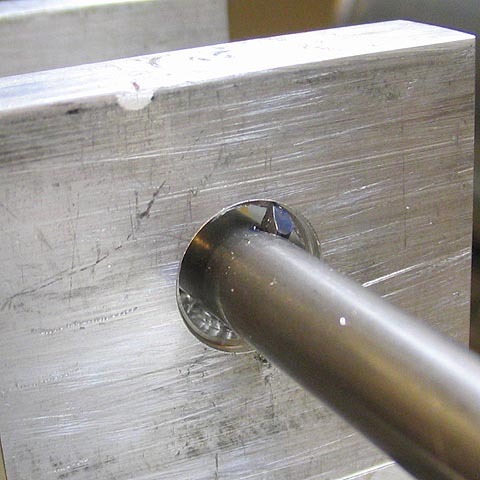 Then it's inserted into the hole in the bar and tightened down. over it without hitting the chuck or the tail stock. 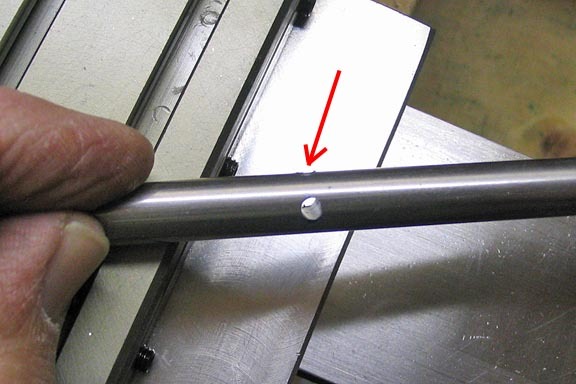 place when I loosen the cutter screw. It can take a minute or two to get the cutter set just so. 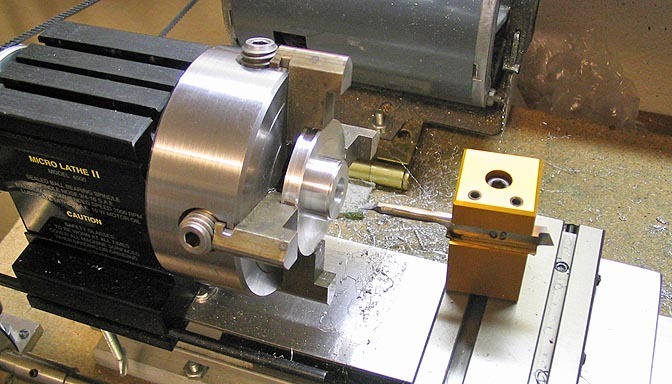 This bore is made to correspond to the size bearing I had a mind to cut. 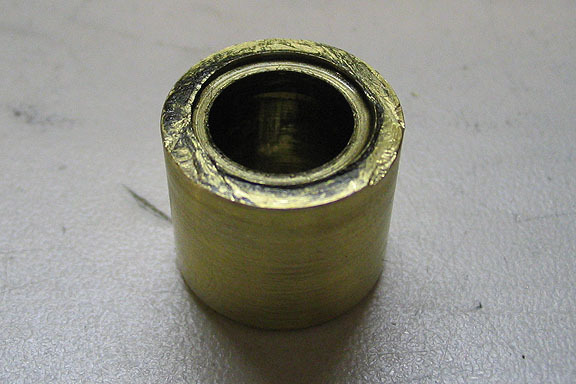 .001 over the size of the bore in the body, for a snug press fit. for the spindle. I used a 3/8 ream for this step. 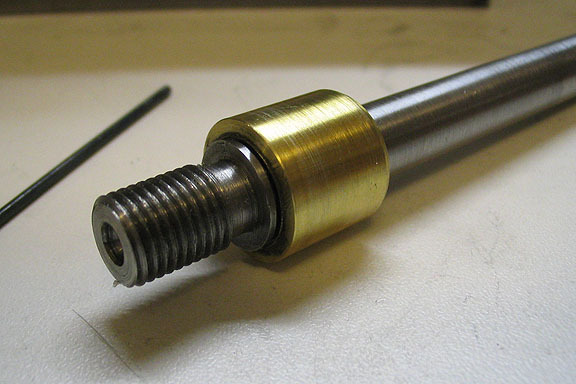 For the spindle, I used a piece of 1/2" CRS. 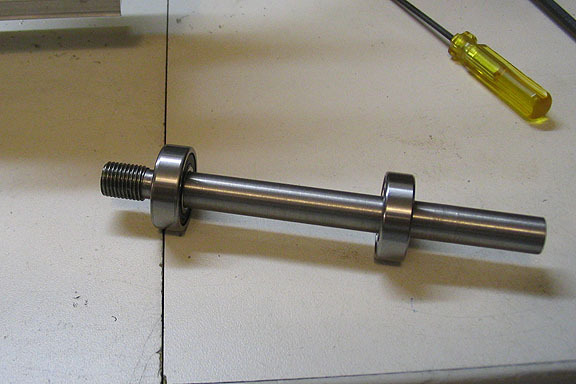 The end is turned down and threaded for 3/8-24. to the proper dia, and polished with fine crocus cloth or 1200 wet/dry paper. After the threads are cut, all remaining work on this piece is done between centers. I turned a pulley of aluminum and bored it for the arbor. 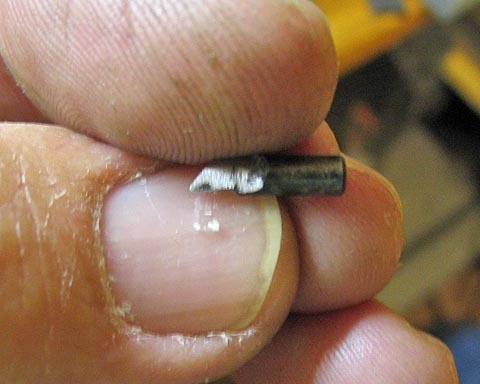 Then it was drilled and tapped for a set screw. motor for power, and need all the reduction I can get. O-rings to be very tough when used as a drive component. They do stretch though. sewing machine motor I'm using, this will do well. This the the finished item, shown with the run-of-the-mill $15 replacement motor for a sewing machine. the shaft. I left the shaft long at the back in case I should need to mount the pulley in that position sometime. holes for the motor there. After hooking up everything, I realized I had put the motor on the wrong end! It ran backwards. Live and learn. 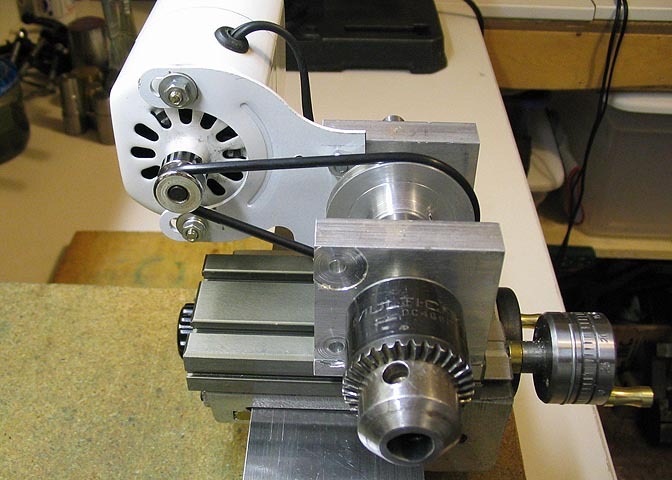 After drilling new holes in the other end and rotating the motor 180 deg. Now I can continue with the original project. The one I was working on when I found I needed to start this project. 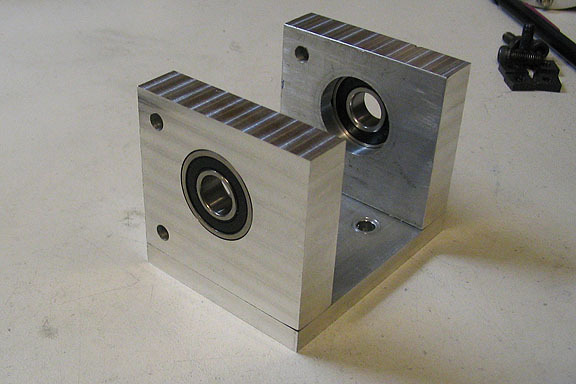 An update on the auxiliary spindle. bearings from the local auto parts store. 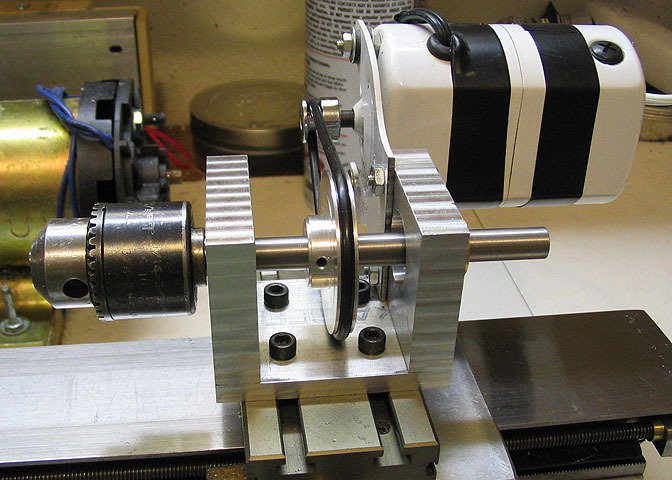 The spindle got pretty tight in the bearing, and I had to drive it off the shaft. where it ran against it. close fit in the new bearings. 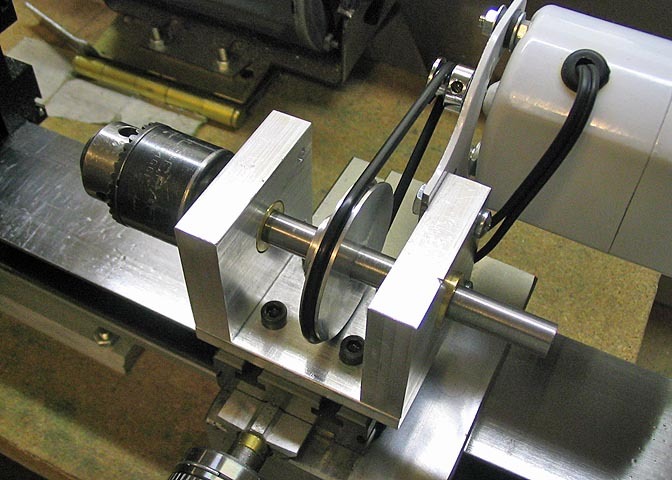 The shaft is checked for fit in the new bearings. made from an old broken drill bit. 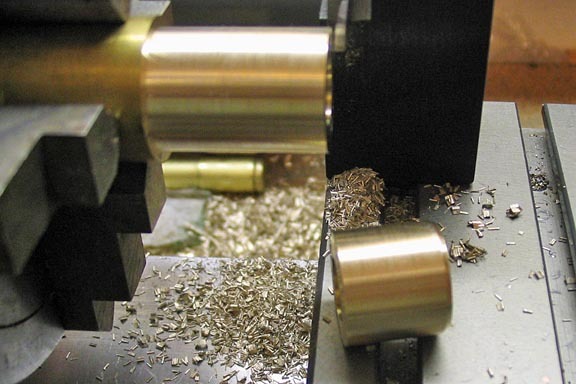 I save all my broken bits and dull end mills for making cutters. 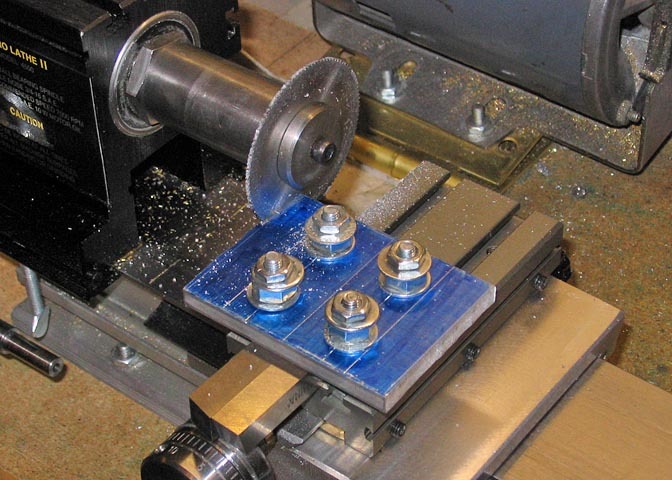 and the bearing race is just under .001", and a vise will press them together pretty easily. 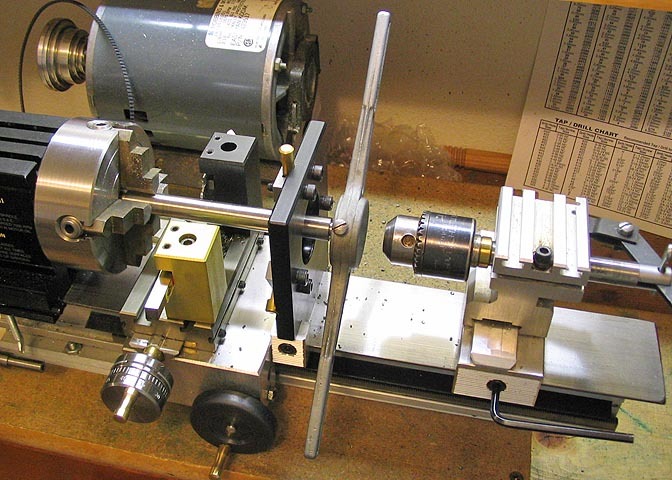 The main body with its' brand new bearings. The bearings are KYK brand #R6-2RS. And it's back in action. New bearings and a freshly milled exterior, just for looks.